Cop cams seen on TV are usually grainy and shaky with a narrow field of view. While they are helpful in providing evidence and assisting in arrests, these have been significant limitations. Now, Panasonic is offering a new model of body worn camera with megapixel resolution and panoramic imaging to address these problems. In this note, we look at this new model, its novel advantages, and compare to existing body worn options. Clip-on camera unit, 1.3MP resolution with 180º fisheye lens, and built-in microphone. H.264 recording, up to 30 FPS, stored to SDHC card on board. Body-worn battery pack with up to five hours battery life. This battery unit also connects to the network docking station for download of video. Docking station, PoE-powered, with automatic upload to central storage. A future release is planned to integrate this video with Panasonic's Arbitrator in-car video management system, so all video will be stored in one place. No integration with Panasonic's i-Pro video surveillance products is planned. The WV-TW310 is avaiable now and has an MSRP around $1,000 USD, varying by camera cable length and docking station options. Wide angle lens: The TW310 features a fisheye lens with a 180º horizontal/140º vertical field of view, much wider than most body worn options, which generally have FOVs less than 90º, with some 120º options available. This makes the camera's field of view practically everything in front of the officer, no matter we he wears the camera on his person, potentially providing better information during post-incident review. Image correction: When using the TW310's viewing software, raw fisheye video is corrected and flattened. Additionally, image stabillzation is applied, so shaky video, chases or altercations for example, appear more stable and level. 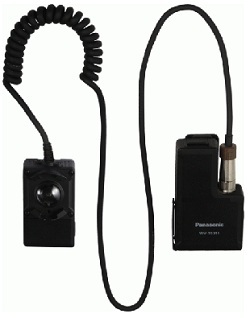 Size: Compared to some competitors, which clip onto the collar, lapel, or pocket, Panasonic's offering is large, requiring a battery pack and remote camera unit. This may be an annoyance. More to wear: Some body worn camera options integrate with the officer's two-way radio, replacing the standard mic, and recording bidirectional audio, both local and from dispatch. This may be preferred for investigation purposes, as well as reducing bulk. Battery life: The TW310 reports five hours of continous battery life, as opposed to eight hours or more from many competitors. In many cases, five hours may not cover an entire shift, requiring the officer to charge the unit while in the car, or carry a second battery pack. This camera may be the highest video quality 'cop camera' on the market but it does come with comparative logistical restrictions that will need to be carefully considered.